There’s no more joyous time than childbirth, but it’s a time that can be full of anxiety. At Family Birthplace, we encourage you to make your birth experience uniquely yours with a personalized birth plan that details everything from your medication guidelines to aromatherapy preferences. Your comfort and privacy are assured as you prepare for delivery in our comfortable suites, and you can rest confidently knowing that you have a dedicated delivery team trained in all eventualities ready to step in at any time. There’s immediate support for baby, as well, with a Level II Newborn Intensive Care Nursery that can take care of babies born early, as well as those that need a little extra help getting started on life. When delivery is over, we encourage rest and relaxation before you and your baby begin a new life at home. We’ll continue to support you there, as well. We encourage families to actively participate in planning for your care and decision making. Please discuss your birthing plans with your physician or midwife and share it with us upon your arrival at the Family Birthplace. For those times when a higher level of care is needed, we have state-of-the-art equipment and maintain the highest standards, skills and expertise in perinatal services. Valley View’s Family Birthplace includes a Level II Newborn Intensive Care Nursery and is equipped to take care of babies born as early as eight weeks before their due date. We are also ready to help when term babies need some extra care in the first few days of life. – Those who are quite certain they will want pain relief. affect their labor and delivery. – Those who would prefer to give birth without any pain relief. No matter which category you fall into, it is important for you to know how anesthesia and pain relief are used in labor and delivery. Even if you fall into the latter category, remember the old adage: It’s a woman’s privilege to change her mind! No two women experience childbirth in quite the same way, so it is important to keep your options open. Every woman should be prepared for the possibility of needing an anesthetic. Epidurals are available if needed. Talk to one of our staff about the best plan for you. Valley View Hospital is proud to be one of the few hospitals in Colorado to offer this additional, safe pain relief method. Nitrous Oxide is a safe and effective method of pain relief in laboring women. Widely used in Europe for decades as a pain relief option, Nitrous Oxide has become increasingly popular in the United States. The Nitrous Oxide in our birthing center is 50 percent nitrous and 50 percent oxygen — a much lower concentration of nitrous than used at a dentist office, resulting in less side effects and sedation. Within 30 seconds of inhaling nitrous you will begin to feel some pain relief, therefore we encourage you to begin inhaling just before each contraction and through its duration. When you are not breathing in the nitrous the effect wears off within minutes. Best of all, you will still be able to move around while using nitrous oxide, so you may make use it while standing, squatting, sitting in a rocking chair or on a birth ball. About 10 percent of nitrous users may experience some dizziness, therefore your nurse or provider may assist you in getting out of bed. Use of Nitrous Oxide in labor has not been shown to slow labor or have any adverse effects on the baby, and there is no point in your labor when it is too late to use this method of pain relief. 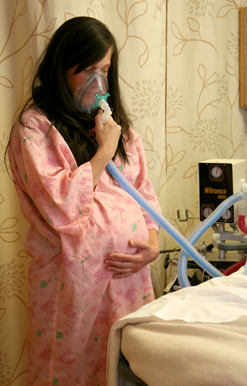 Women who use nitrous may still choose to have an epidural at a later point in their labor. Using nitrous earlier in labor can allow you to remain mobile and upright longer, promoting the baby’s descent before being confined to bed with an epidural. Supporting new mothers has been a hallmark of Valley View for many years and continues to be a reason why so many expecting families choose Valley View. With an expert staff and support providers on hand every day, new mothers never have to worry about providing for their baby. We believe that you and your family come first. At the heart of our patient-centered care philosophy is the belief that healthcare providers, patients and their families are partners, working together to best meet the needs of you and your baby. Our staff of compassionate professionals are eager to plan your birthing journey with the very experience you want. Contact us for an appointment, tour and consultation. – You are going back to work and want to keep nursing? – Do you need expert breastfeeding support and care to? We offer comprehensive, personalized care for nursing mothers and families. Our team of experts will support you every step of the way. – Do you have any questions about breastfeeding or pumping? – Would you like to know how to get off to a good breastfeeding start? – Have you wondered if you should stop breastfeeding or have been told to? – Are you simply seeking reassurance from compassionate professionals? We are here to provide expert advice in a compassionate, caring environment tailored to your lifestyle and unique needs. Chat Time — Is a support group for new moms. It is every Monday from 10am to 12, at Valley View Hospital, second floor room 2B. This is a program run by our lactation consultants. With so much information available on the internet, cable channels and DVDs, some expectant parents wonder, “Why should I make a birth plan?” We feel that partnering with you and providing education and support is laying the foundation for being a good and attentive parent. Spending structured time to stay healthy and become prepared for your baby is your first responsibility. Even if you plan to use pain medication for your birth, working with our team on a birth plan can provide and support a variety of coping methods, ease discomfort, help you learn about your baby and make a positive transition to parenthood. Ask us more! Baby-Friendly means doing what’s best for you and your baby. The Baby-Friendly Hospital Initiative assists hospitals in giving new mothers the information, confidence, and skills necessary to successfully initiate and continue breastfeeding their babies, or safely feed with formula, and gives special recognition to hospitals who are upholding the highest standards of infant feeding care. The Family Birthplace at Valley View is proud to be designated a Baby-Friendly facility. As a Baby-Friendly facility, your newborn baby will be placed on your chest for immediate bonding. This includes skin to skin contact immediately after birth and throughout your baby’s stay. The American Academy of Pediatrics and healthcare providers recommend exclusive breastfeeding for six months, followed by continued breastfeeding as complementary foods are introduced, with breastfeeding continuing for one year or longer.